Two cute black and white cats are sitting in a box. 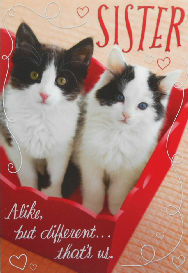 The front of the cards says: Alike, but different...that's us. Inside greeting: I love the things we share and the ways we are different, but most of all I love knowing we're always there for each other, no matter what. Happy Valentine's Day. The card is 4 3/4" wide x 6 7/8" high. Red envelope included.